DENVER, Colorado, February 20, 2012 (ENS) – After three years of legal battles, conservation groups have won a lawsuit challenging a logging project near the headwaters of the Rio Grande on the Rio Grande National Forest in southern Colorado. While the Forest Service claimed that logging on Handkerchief Mesa would reduce current or potential impacts from insects and disease, Rocky Mountain Wild and WildEarth Guardians argued that logging and roads would further degrade forest health and watersheds. The order issued February 9 by Judge William Martinez of the U.S. District Court for the District of Colorado puts a stop to logging on 3,436 acres. The timber from that project would have amounted to approximately 8.3 million board feet, enough to fill about 2,075 logging trucks. It would have required nearly 11 miles of road reconstruction. 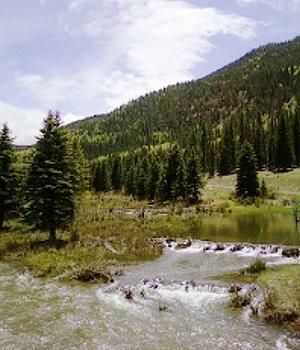 The Handkerchief Mesa timber sale area is near Wolf Creek Pass in southern Colorado. Miles from any community or infrastructure, the forest is still recovering from vast clearcuts and over-logging since 1950. The soils in the Handkerchief Mesa area are prone to erosion and landslide, so area streams are clogged with excess sediment from past logging and road construction. Rivers and streams in the area form the headwaters of the Rio Grande, which provides drinking water to millions of people in southern Colorado and New Mexico. The conservation groups contend that the Handkerchief Mesa timber sale would further threaten the soil health, hydrology and wildlife habitat an already fragile area. The court agreed with the conservationists that the government’s environmental assessment of the timber sale had failed to demonstrate that soils would not be impacted and that the Forest Service did not have adequate information on soil conditions. The court also agreed with the groups that the Forest Service did not have sufficient information on the infestation of Western spruce budworm in the logging area. Judge Martinez found that the Forest Service had failed to demonstrate that the logging combined with trees defoliated by budworms would meet the standards for forest regeneration. The spruce budworm is the most widely distributed and destructive forest defoliator in western North America. Several recent outbreaks have occurred in Colorado, the largest exceeding two million acres. The insect outbreak increases the vulnerability of Colorado forests to wildfires. The groups argue that the Forest Service should focus its resources on protecting human lives and infrastructure from fires. “The lawsuit is noteworthy because it forces the Forest Service to account for changes in forest ecology and health from insects that occur not only due to the agencies’ own actions but that also result from climate change,” said Bird today in an email to supporters. The timber sale area is inhabited by several threatened or endangered species, including the Mexican spotted owl, peregrine falcon, bald eagle and Canada lynx. “The spruce-fir and glorious aspen forests are home to the elusive Canada lynx, which now has one more forest refuge,” said Bird. Students at the Environmental Law Clinic at the University of Denver Sturm College of Law provided legal representation to the conservation groups.